Weeds. They can be like urban wildlife, with endless amounts of time to find the weaknesses in your domicile to one day become uninvited houseguests. Through drain holes, in small piles of woody debris and in bark — as tubers, rhizomes, flying seeds, spores — weeds are constantly looking to cozy up and share the home of container crops. The first line of defense for container-grown plants is prevention. For the nursery industry, the core aspect of that defense has been herbicides. In recent years, though, for nurseries inside and outside Oregon, mulch has risen to the top (pun intended) as another mode of suppressing unwanted weeds. Some nurseries are reducing or severing limiting — or even almost eliminating — their need for herbicides and incessant hand weeding to keep their plants clean. Mulches are extremely effective. They can be applied and stay in place for the entire production cycle of the crop as a very valuable tool in weed control, according to James Altland, a research horticulturist with USDA Agricultural Research Service who was formerly stationed at the North Willamette Research and Extension Center. He noted that this is especially true in the case of high-value specialty crops such as hydrangeas, which are chemically sensitive. What’s more, most herbicides are not labeled for inside growing in greenhouses. The type of loose mulch a nursery chooses often depends on regional availability, as mulches are heavy and can be difficult to transport. Altland reports that transportation fees can add up to more than the cost of the material itself. The exception is rice hulls, which are distributed and marketed throughout the United States, although hardly in Oregon. They are sourced mostly from Louisiana, Arkansas and California and are dry and easy to ship. Rice hull mulch is expanding rapidly in other parts of the country because of its effectiveness. Altland recently toured Ridge Manor Nursery (Madison, Ohio), for instance, and found the nursery almost exclusively using rice hulls for weed control, with only occasional herbicide use. On the other hand, Oregon has something no other part of the country has: a thriving, expanding hazelnut-growing industry. According to the Oregon Hazelnut Commission, more than 70,000 Oregon acres are in hazelnut tree production, and the industry is currently in expansion mode, with more than 8,000 acres being planted each year. 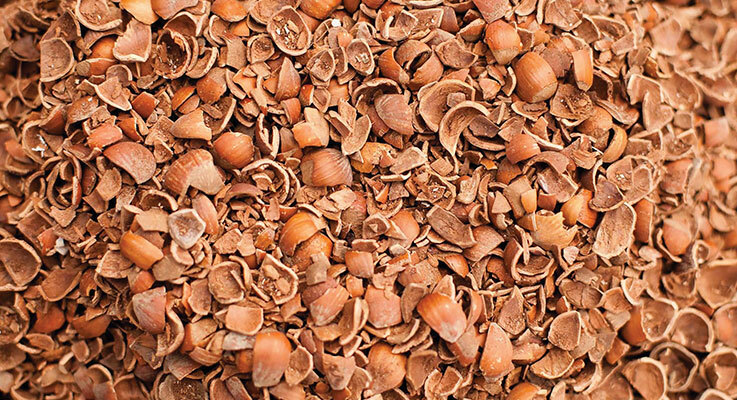 The shells that come from processing the nuts were for a long time an abundant byproduct just waiting to find a newfound utility — and they have, as a mulch for containerized growing. J. Frank Schmidt & Son Co. (Boring, Oregon) has been using mulch in greenhouse container production for nearly 15 years, and at this point, the business uses only crushed hazelnut shells. “In the past, we used to have to buy them and crush them smaller ourselves,” said Guy Meacham, new plant development manager. That’s because the nursery bought directly from the nut processor. Now, suppliers are available to deliver already processed shells at a requested size. Schmidt buys two or three truckloads per year of processed shells from Decorative Bark Products (Boring, Oregon). “If we don’t have to do the crushing and it’s the same price, it’s a win for us,” Meacham said. Meacham hit on the idea of hazelnut shells after seeing another nursery trialing cherry pit mulch, and use of rice hulls in the southeast. “We were looking for a material that doesn’t hold water, that is naturally dry, is a byproduct of some other processing, and wouldn’t cost too much,” he said. Meacham was looking at mulches particularly to address the problem of moss and liverwort growing on the containers during the winter season. And he found it. As long as you have full coverage and the compost is clean. At Schmidt, from liners up to 3-gallon containers are tipped as they come off the potting machine, and shells are scooped to the point of complete coverage as the plants pass by on the conveyor. It’s not very scientific, Meacham said, and the depth inexactly measured, but the goal is always the same — cover the compost completely. The shells are completely benign, becoming part of the compost without drawing nitrogen away from the plant in the year they take to break down, Meacham said. Schmidt only applies the shells to sizes up to 3 gallons because for larger sizes, they’re expensive, and once outside, the mulch is harder to maintain. “It is more expensive than herbicide treatment, and because you have more options outside, there are cheaper alternatives,” Meacham said. The shells are removed for shipments to Canada, where they count as a different agricultural product than nursery plants. If Canadian customers have a permit that does not include hazelnut trees the shipment could be impounded. Schmidt buys a year supply of shells after the hazelnut harvest is over, typically December through January, in time for spring and early summer processing, and stores it outside. Because nutmeat can still cling to the shells, there can be a short-lived vermin problem and issue of crows tearing apart newly potted plants in search of the meat. Schmidt works around that by barricading the greenhouse during that time, and the problems go away in a few weeks once the nuts turn inedible. Chris Robinson, general manager of Robinson Nursery Inc. (Amity, Oregon), had a challenge. He needed to reduce damage to the roots and trunks of the containerized trees from herbicide use, which the nursery was spraying up to 8 times in the trees’ two-year cycle. Observing the trials of a competitor who planted at different depths, Robinson settled on 1–1.5 inches of hazelnut shells. The plugs are planted a little higher than the bark-based media, and the remaining height of the container is layered with hazelnut shells, which are delivered annually to a bin built by the nursery. One challenge was finding a good way to fertilize the plants. The nursery found success layering the fertilizer between the bark and the shells like a subdress, Robinson said. Another challenge was the crush size. The extremes of too fine or too whole, even half shells, were problematic. Instead, the nursery special orders a crush size that won’t fall out of the containers or be too dusty during application, which can be an issue for people with allergies. However, they still make sure everyone is wearing dust masks during processing. The mulch is added mechanically during propagation, so there is no labor added. “We did subtract $10,000 of herbicides and man hours to put on the herbicide by switching to the mulch,” Robinson said. There’s only a small amount of manual weeding when the plant is fully rooted, and the only time herbicide is used is at a one-half rate in the spring the trees are sold. “That’s when we see the seed pressure pick up,” he said. Al’s Garden & Home (Hubbard, Oregon) also uses only hazelnut shells as container mulch, and has been for about 10 years. Only plants grown six months or more and in 1 gallon or larger pots are mulched, according to Dorothy Russo, chief of growing operations. That includes primarily perennials and woody stems and no annuals or other plants that require a quick turnaround. “Not only did the shells help with liverwort and other weeds that were hard to get out of the plant material, but also everyday weeds and slugs, because they don’t like to crawl over them,” Russo said. Sometimes there are still weed outbreaks, and the shells harbor those seeds; nevertheless, there is a significant reduction in the amount of weeding, and Russo said they’re producing a healthier plant. Al’s uses no herbicides in the greenhouse, and Russo estimated that, overall, herbicide usage has been cut at least in half. “If the outbreak is bad enough, we’ll remove the top layer of mulch and put a new one on, but if we can get the weeds out early and before they go to seed that’s unnecessary,” Russo said. The mulch is applied at the end of Al’s production line at a depth of 1.5–2 inches, after the labels are stapled on the pot while the plants are still off the ground and before the plants are racked. That depth is more easily achieved on the 5-gallon and larger containers, and production aims for the same with the smaller 1–3 gallon sizes, which can be challenging if there is too much soil on top or the soil isn’t packed down enough. The nursery did experiment with a finer shell size — twice-cracked and even thrice-cracked shells — on 5-inch containers, which were just too small to be workable. The solution was to shorten the production time rather than mulch, Russo said. Al’s has built specific storage bins to keep the shells dry, although they can be handled get wet. The dry shells are just easier to handle, more “user friendly,” when they go through the production process. The shells are light, and transporting finished plants from the nursery to stores does mean shells are strewn around. “It is the nature of the product,” said Russo. But, he considers the problem merely cosmetic compared with the incredible benefits. Kyle Plaisted, owner of KP’s Harvest Time Products, LLC (Mount Angel, Oregon), with a capacity of 3 million pounds, delivers to several nurseries, including Al’s and Bailey Nurseries (Yamhill, Oregon). A typical order could be 6 to 10 super sacks of crushed shells, at 2,000–2,400 and $180 per sack; whereas loose, bulk crushed is approximately $80 per yard. Unprocessed bulk half shells are $40 per yard and $100 per super sack. For all prices, shipping is extra and depends on distance, although customers can pick up with their own trucks.